I think maybe it’s no small surprise that Oscar and Tony Award winner Martin McDonagh has stopped writing for the stage in order to concentrate on writing for the screen. One, he’s good at it. His first short, Six Shooter, won him an Academy Award. His first full-length feature, In Bruges, has already won a bunch of awards and is currently nominated for an Oscar for Best Original Screenplay. 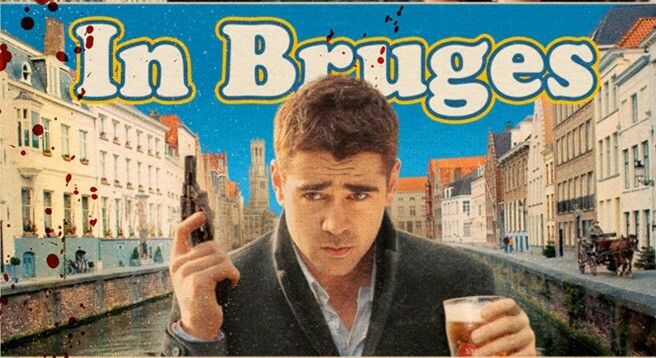 Both Six Shooter and In Bruges have things in common with our current production of The Lieutenant of Inishmore – Irish gangsters, guns and gore. The latter two items are what make me not surprised he’s more interested in Hollywood than Broadway at this stage of his career. His patented hijinks are certainly easier pulled off on film. Just about all of his plays require some sort of weird special effect. The Beauty Queen of Leenane required a hot stove and boiling oil to be poured over an actress’ hand. It also required a breakaway piece of skull for when the daughter whacks her mom with a fireplace poker. In The Pillowman we needed fake toes in a box, a rig that spurt blood when one of the detectives sticks a pen in the suspect’s ear, and a bag of brains and blood that covered that same actor’s head for the end of the play when he’s shot. There were also weird things in that one like crucifying a little girl with a bloody crown of thorns and all and then painting the same little girl green later in the play. Another of his works, A Skull in Connemara, requires multiple skeletons to be crushed up into bits through the course of the play. Well, he hadn’t gotten around to Inishmore yet – certainly his piece de resistance when it comes to custom props and special effects. Boy howdy. When the news broke a while back about the Sarasota actor who shot his castmate at the end of Of Mice and Men I cringed, knowing I was going into a show with so many weapons on stage. I really want to make it clear that this could never happen with us (and should never happen anywhere). All of our stage weapons can only take these blank loads, and there is no barrel on the gun (it’s completely solid) for anything to come out of the front end. The rounds themselves are nothing but the parts that would make noise (sorta like a firecracker), there is no actual ballistic. While loud, you can’t really shoot anyone with the weapon or the rounds we use. We also have multiple other layers of security in place – no one but the actor, the weapons master or the stage manager ever touches the weapon, the weapon is checked twice every night before the rehearsal and checked again at the end, the weapons are regularly cleaned to ensure proper function and the actors given lessons on how to handle and care for them. The weapons and all ammunition are also kept locked up when not in use (even the BB gun). At one point in the show – all 6 weapons are in use at once on stage. I’m still waiting to hear how loud that will be (and the geeky kid in me honestly can’t wait). We’re seriously contemplating handing out earplugs for the audience. In that one sequence alone, 25 blanks will be fired in less than maybe 2 minutes. But that’s not it. I don’t want to give it all away, but we’re estimating 4 gallons of blood will be spilled on stage in less than an hour and a half. We have three different “special effect” cats. Multiple special effect bodies or parts. Four blood effect rigs involving actors that are guaranteed to cover the walls (and some of the actors). Am I scaring anyone? I hope not – did I mention the play is really, really funny? It is! It’s a tremendous satire on violence, on terrorism and on the human condition. Ok, so there’s still plenty of things I’m wondering exactly how in the hell we’ll pull off. But – I trust. I believe. So far, so good. Things are coming together extremely well. Case in point: one of these specialty props we needed is an old, beat up woman’s bicycle. It had to be pink. We considered getting any woman’s bicycle and painting it. I went by Joe Haskin’s Bicycle Shop yesterday after work and looked around, but saw nothing. A man comes up and asks me what I’m looking for, so I tell him. He thinks, frowns a bit and says they don’t sell anything like that. Then he gets an idea, goes into the back and comes back out – telling me to meet him at the gate around back. When I walk up, there is sitting a gorgeously ugly 24in. woman’s bicycle with hot pink handlebars, tires, seat and accents with a periwinkle body. PERFECT, I say. I ask how much he wants for it, and he tells me to take it – saying he could never actually sell that back. It was sitting in a bike pile of junk bikes. Considering we’re already spending about $4,000 between all the weapons, all the special effects and the clothing that will be ruined nightly – free is an awesome price. The major difference to the way I normally work in regards to this show is how early we have to start teching. We are bringing things in far earlier than usual, and will have about two full weeks of tech this time around to make sure we get everything right. Certain items – like the guns and bicycle, are already in use nightly. Another batch of specialty items come in this week, and the last batch of blood rigs and effects will be in March 6. That means though I have to have the acting ready a week earlier, and will have far less time in tech to deal with actors since there is so much technically to get set and right. I’m riding these guys HARD right now. If you ever see any of them out, buy them a beer. I’m sure they need it. I got my eye on the prize though. This is going to be so cool if we pull it off the way we want it to. McDonagh cites the work of Pinter and Shepard on stage and the work of Scorcese, Stone and Tarantino in film. Once you see The Lieutenant of Inishmore, you’ll definitely see why. I hope you can make it out opening weekend. This is such an expensive show and we’re really hoping to add that 4th weekend ASAP to help us better pay for all this. We can’t do that til we sell opening weekend out. We don’t have that far to go. People are always asking how they can help, and the first answer is always to buy a ticket in advance. This is going to be a spectacle, ladies and gentlemen. Tampa Bay’s never seen anything like it – I guarantee you. I am really excited for you. If I could be there I would be the first in line. I too have an inner geekiness and am uber curious about how loud the gunshots will be. Seriously, if I could afford a trip to Tampa, I would spend the second half of my spring break there, just to see Inishmore! Just the two words Martin Freaking McDonagh should be enough to sell the entire run out. Well, he’s not as popular as Steve Freaking Martin, so we’ll see. But I agree. Beauty Queen and Pillowman both did really well for us. I hope folks remember how good those shows were, and that some of his new-found Hollywood cache help, too. It’s scary how expensive this show is for us, but I really think the risk is worth the reward. Maybe you could get the NRA to underwrite the expense of the guns and ammo. In return a note in the program. Love the picture of the uber Mexican standoff. It’s a real “lawyers, guns, and money” moment.